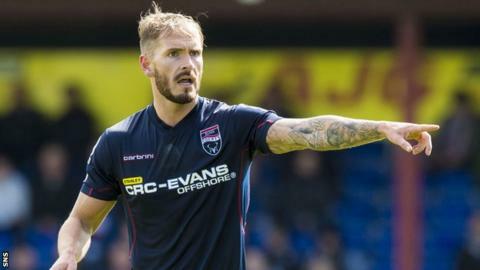 Family issues have been cited after midfielder Martin Woods returned to Ross County three months after leaving Dingwall to join Shrewsbury Town. The League One club say they agreed to terminate Woods' two-year contract and he struck a similar deal with County. Shrewsbury manager Micky Mellon said: "Unfortunately, Martin has had to return to Scotland due to personal reasons to do with his family." On-loan goalkeeper Daniel Bachmann has returned to Stoke City from County. The 21-year-old has made two appearances for the Scottish Premiership club this season, but the Austria Under-21 cap has found himself second choice in their other six games behind Scott Fox, the summer arrival from Partick Thistle. And County, who will seek a replacement as back-up to Fox as well as being in the hunt for a striker, say the loan has been terminated by mutual consent. Woods had started Shrewsbury's first five games of the season before missing the last two. "It is sad that he has had to return home, but sometimes that is the way things go in life, never mind football," said Mellon. Woods, previously of Leeds United, Sunderland, Rotherham United and Doncaster Rovers, had joined County in October after leaving Barnsley. Now he has agreed a two-year deal with County, with an option of a third, having turning down a better financial offer from another Premiership club. County manager Jim McIntyre told his club website: "Martin was instrumental in the great run of form that this club enjoyed in the second half of last season. "So we know what he is capable of and it is great news to have been able to get him back to the club on a long-term contract. "When we learned Martin would be open to a move back to Scotland, we didn't hesitate in putting a deal in place for him. "Martin will add more quality and bring competition for places to the squad, is looking forward to coming back to Dingwall and I'm sure the fans will also be looking forward to seeing him in action again." Meanwhile, 20-year-old County striker Kyle MacLeod's loan agreement with Elgin City in Scottish League Two has been extended until January.